EA Wizard is a software that allows anybody to create quickly, simply and without programming own “Expert Advisors” (EA) for MetaTrader4. Build any strategy you want with EA –the simplest way to convert your trading idea into a trading system for testing or live trading. Test your trading idea on real market data and immediately find out if the strategy is profitable or not. Each strategy can be saved as an EA for MetaTrader4 with full source code! Each trader should be aware that each trading strategy must undergo a robustness testing control before it can be used for live trading. Of course, it is possible to test strategies manually, but it is very time-consuming. You can save a lot of time by testing your ideas fully automatically by using EA. If you’re not a programmer, you probably can not afford to hire a professional programmer who would help youto create a strategy for each of your ideas and then continually implement all your strategy changes and improvements. 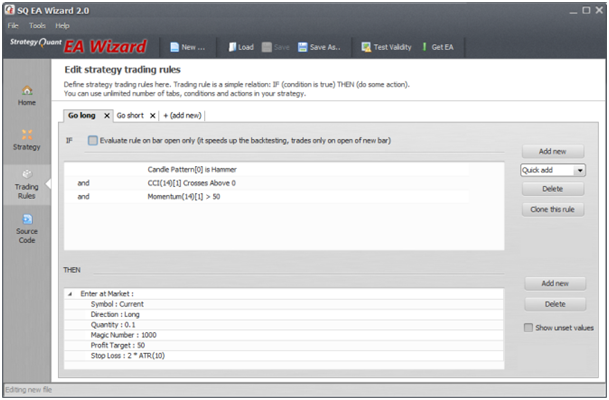 EA Wizard enables you to create your own automated trading system that executes trades in compliance with the rulesyou have set out. EA Wizard is a simple tool to use, you do not need to be a programmer. No matter how complex a trading strategy is, it can always be defined as a set of conditions. Conditions are IF – THEN links – if a condition is met, then the specified action can be executed (e.g. if an indicator exceeds the specified value, then open the position.). Ask yourself a question: Are you able to define rules as in the picture? Then you are able to create your own strategy for EA at EA Wizard without programming. Do not risk anything. If you will not be satisfied with the program EA Wizard, you can return it within 30 days without giving any reason and we will refund your money back. What do you get with EA Wizard?